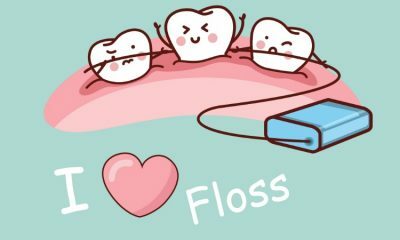 Dental Care Stratford: Should We Floss? Flossing has been linked to good dental care for years. It has been a prominent part of good oral hygiene because it removes the particles of food from your teeth after meals. With so much bacteria already in the mouth, flossing does its part to cleanse the small areas between the teeth. Not to mention, it also does a great job of removing those embarrassing pieces of food before we head out on a date or to work. Flossing also makes our teeth feel cleaner and more hygienic, so you don’t have to worry about bad breath or embarrassing oral situations. What’s neat about flossing is that it has always been a way to care for your oral health, even in prehistoric times. It has been suggested by historians that horse hair was actually used to floss as well as twigs as a means to remove particles of food from the teeth, similar to a toothpick. Now, aren’t you glad there are several different types of floss to use for dental care when you head to the store? Is flossing still recommended by dental professionals? The short and easy answer is, YES! At Coventry Dental Care, we encourage every patient who comes to us to floss. There was a recent article in the media stating that there was no proof that flossing made a difference. This was shown to be incorrect and biased. Dentists and hygienists agree that you should keep flossing! You should also floss at least once a day specifically in the evening before you head to bed to eliminate the plaque on your teeth and get in those areas that your toothbrush can’t reach. “The Canadian Dental Association supports flossing as one step of maintaining healthy teeth and gums. Flossing is an effective preventative measure to remove plaque, the main cause of gum disease. The weakness of the evidence supporting the value of floss in the prevention of gum disease is a reflection of the difficulty of conducting the necessary studies, not of the value of flossing for the maintenance of good oral health. According to the American Dental Association (ADA), interdental cleaners such as floss are an essential part of taking care of your teeth and gums. Cleaning between the teeth removes plaque that can lead to cavities or gum disease in the areas where a toothbrush can’t reach. Interdental cleaning is proven to help remove debris between the teeth that can contribute to plaque buildup. So after all the confusion, the message remains the same. Brush, floss, eat healthy foods, and see your dentist regularly to ensure that your dental care is in tip-top shape! That’s the 1-2-3-4 of ensuring the best dental health. To contact us for your appointment call 519-305-9100 today!